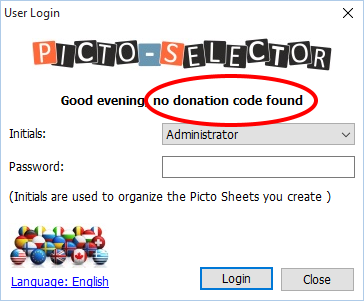 Your donation will help me to improve Picto-Selector and keep it freely available for other people. As contributor you will receive a donation code which will hide the donation dialog when closing the application. Your name will also be used in the login form greeting. As a contributor you receive a donation code that registers the installed application to your name and disables the donation prompt that is otherwise displayed after installing or updating Picto-Selector. The donation code can be used on multiple computers but is personal and is not to be shared. Please use the "Request the donation code" form at the bottom of this page to let me know you have donated and which name you want to use. If you have donated in the past, with bank transfer, bought an USB stick or created translations for Picto-Selector please fill this form, I will look it up and create a code for you.